Trip Summary: www.AmaDablamClimb.com : The October - November period features the year's best weather and climbing conditions, and this season was no exception. 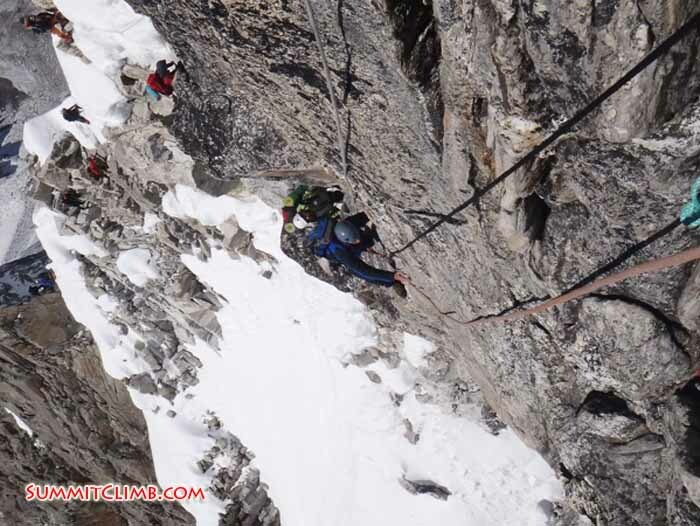 9 out of 10 of our team members and 5 expert climbing sherpas reached the summit of Ama Dablam, Asia's most famous, rock, ice, and snow peak, technical but very climbable. We congratulate the entire team for their fine effort! 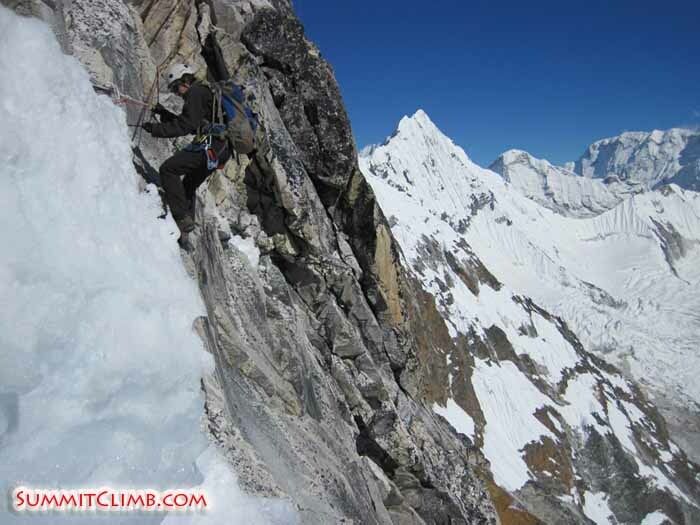 This was our 10th successful Ama Dablam expedition. 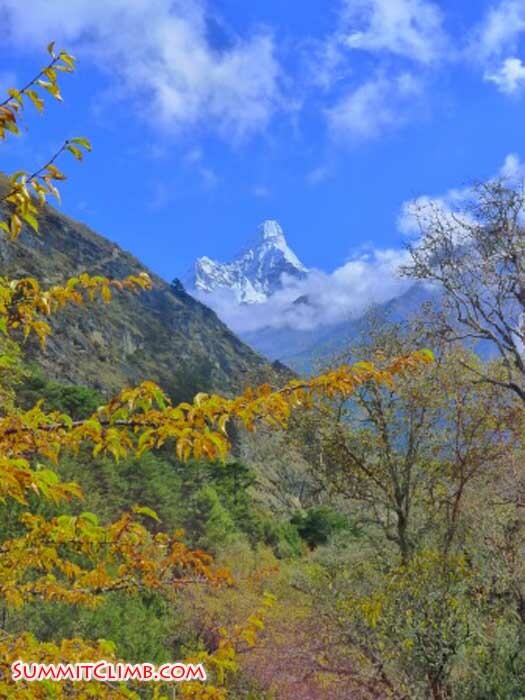 When you arrive at the summit of Ama Dablam, you can see a fine view of Everest just 10km / 16 miles away. 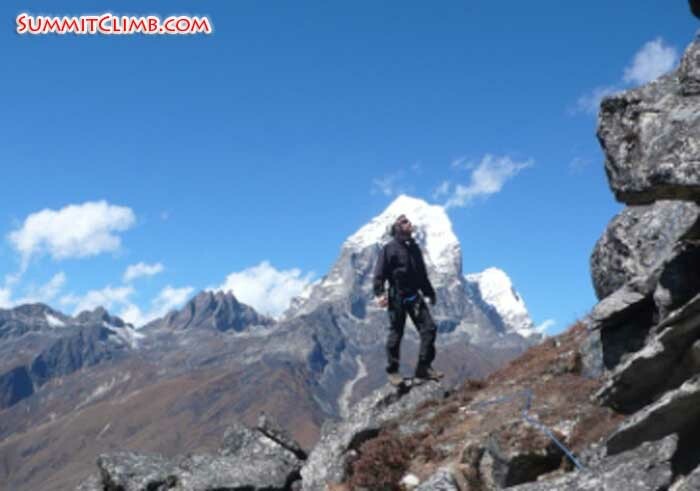 By the way, climbing Ama Dablam is an excellent way to test yourself to 7000 metres/23,000 feet, climb some very fun, rock, snow, and ice, and get qualified for climbing Everest, Cho Oyu, Lhotse, and Shishapangma. 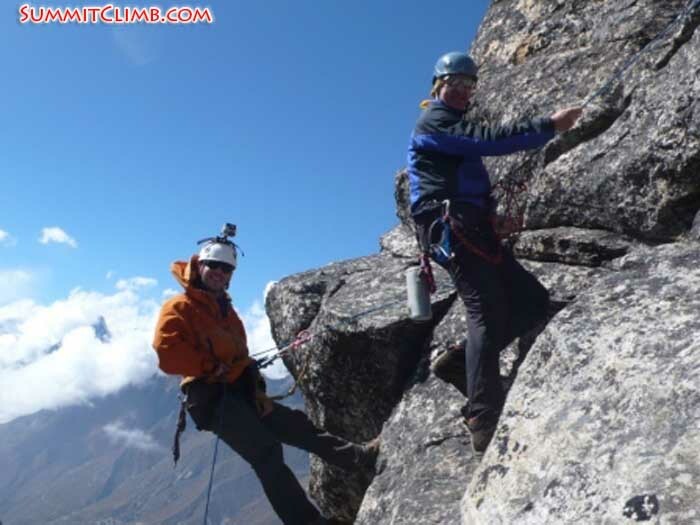 We invite you to join us for our next Ama Dablam expedition! 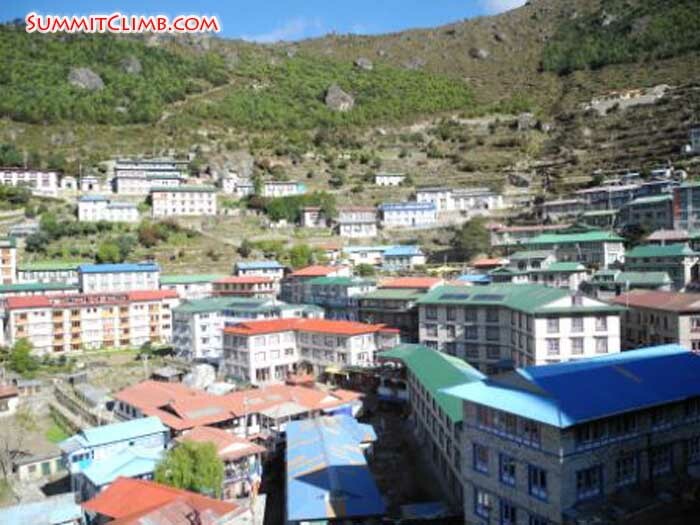 Basia and Tenji Sherpa have left basecamp and are walking to Namche Bazaar today. The weather is currently sunny and beautiful, and the forecast calls for good weather for the rest of this week and next week too. They plan to fly from Lukla to Kathmandu on Monday 28 November. Welcome home and congratulations! Basia called today and she has reached camp 1 safely. She is feeling strong and plans to descend all of the way to basecamp. Go Basia!!! Our tents in camp 1 (Max Kausch). Adrian, Max and Suzie at the summit (Christian Mundl). Basia called in today and said she is doing fine. She is camp 1 and took a rest day there and planning to go to camp 2 today. The weather is good, she and Tenji feel great and are excited to move up the mountain. Galjie sherpa on the top of Yellow Tower (Max Kausch). 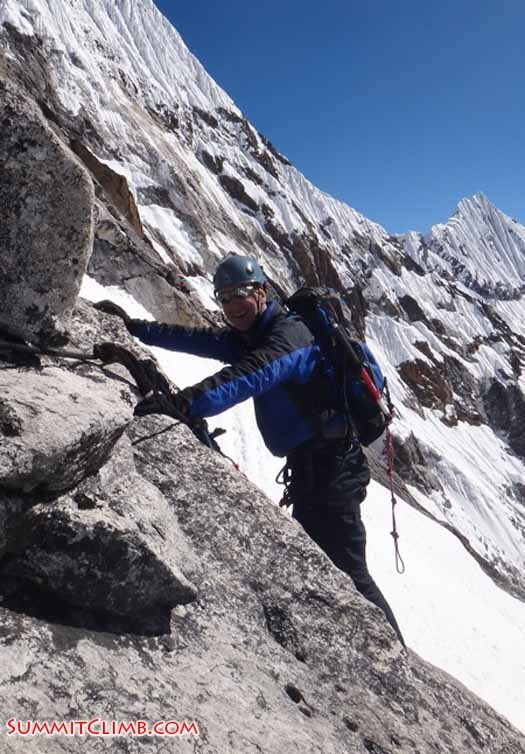 Bill Dwyer on the way to the summit of Ama Dablam - Peter Hamel. Big yak on the way to Ama Dablam - Romain Hoffmann. Basecamp at night time - Liam Suckling. 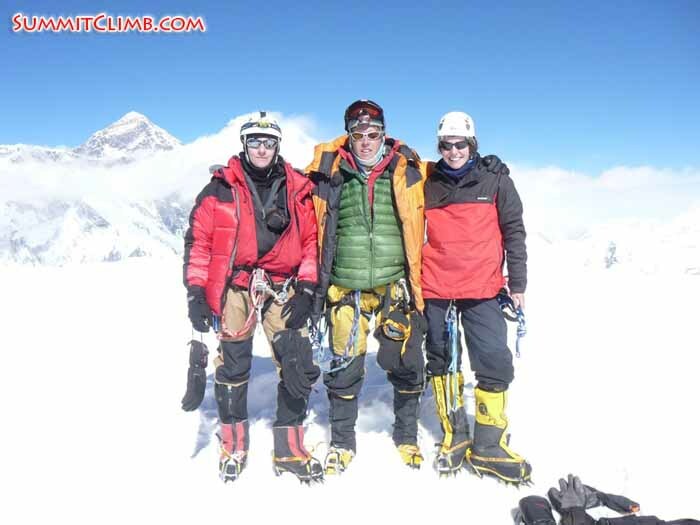 From left to right - Sange Sherpa, Max Kausch and Romain Hoffmann at the summit of Ama Dablam - Grace McDonald. Ama Dablam seen from ABC at 5500m - Jean-Michel Meunier. 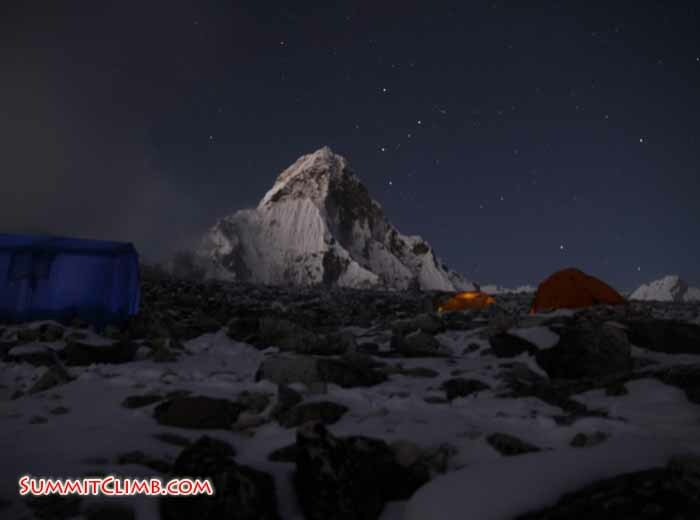 Ama Dablam BC at night time 4500m - Jean-Michel Meunier. Ama Dablam and Lhotse seen from nearby Namche - Romain Hoffmann. Grace and Violetta after the flour war. This is part of the Puja, a buddhist ceremony to welcome the climbers - Grace McDonald. Hi, this is Max Kausch writing a dispatch for the Ama Dablam Expedition Autumn 2011. Today is November 9th and we made it to Kathmandu! The members who already summited are already in Kathmandu. We are still waiting for Richard and Liam who are trekking around some high altitude valleys. Today we got a flight out of Lukla. Violetta, Grace, Frank, Romain, Peter and myself flew at midday. After arriving here we've met John who finished his trek yesterday afternoon. Jean-Michel flew to France yesterday and we hope everything went fine on his 6-day trek to Jiri. We heard that Barbara and Marion made it to Ama Dablam BC today and met Bill. All 3 of them together with Tenji and Thile, will spend 1 week together. We wish them a wonderful trip and very good weather!! We'll have our first group dinner tonight after 1 month up in the mountains. Everyone is healthy and very, very happy! 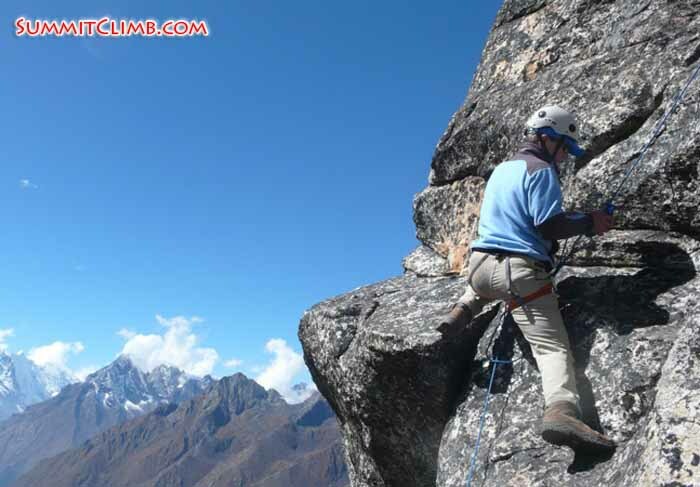 Frank Sarnquist - 69 years old - practising rock climbing techniques before attempting the summit of Ama Dablam - Max Kausch. 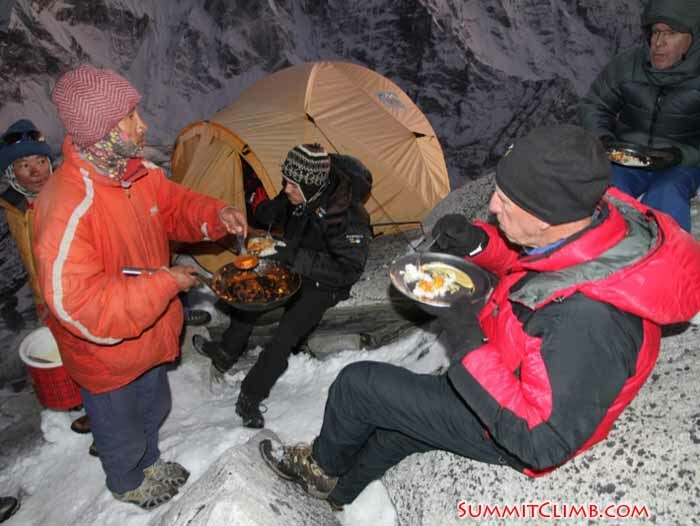 Cooks serving food at Camp 1 5800m - SummitClimb was the only team at Ama Dablam with a high kitchen - this is one of our key factors for such a high success rate - Jean-Michel Meunier. Camp 3 at sunrise - Liam Suckling. 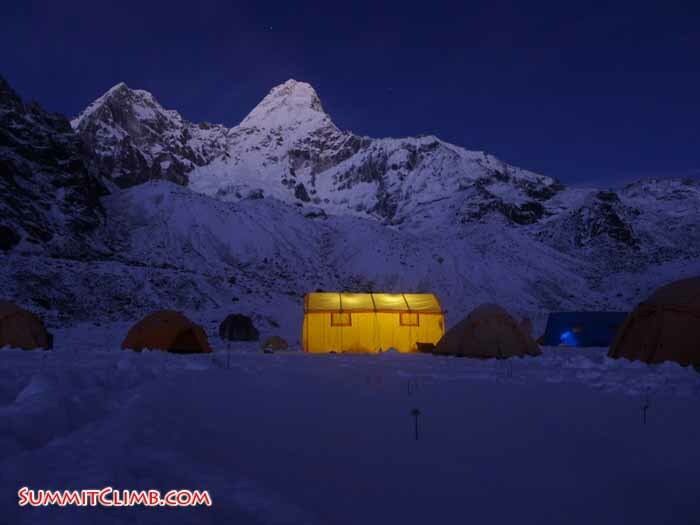 Camp 3 at 6300m - Peter Hamel. Hi, this is Max Kausch writing a dispatch for the Ama Dablam Expedition Autumn 2011. Today is Monday November 7th. Believe or not, we are still waiting for weather in Namche Bazaar. Peter and Romain have finished their treks in the surrounding valleys and are back in Namche. They couldn’t believe when they met 4 members of the team still waiting here. After 6 days of continuous bad weather, today the sky was finally blue and several aircrafts are already flying out of Lukla and taking out as many trekkers and climbers as possible to Kathmandu. We believe our turn to fly out will be on the 9th so we really hope the good weather stays at least until the 10th. John and Jean-Michel are still trekking towards Jiri and we hope to get some news from them in 1 or 2 days. 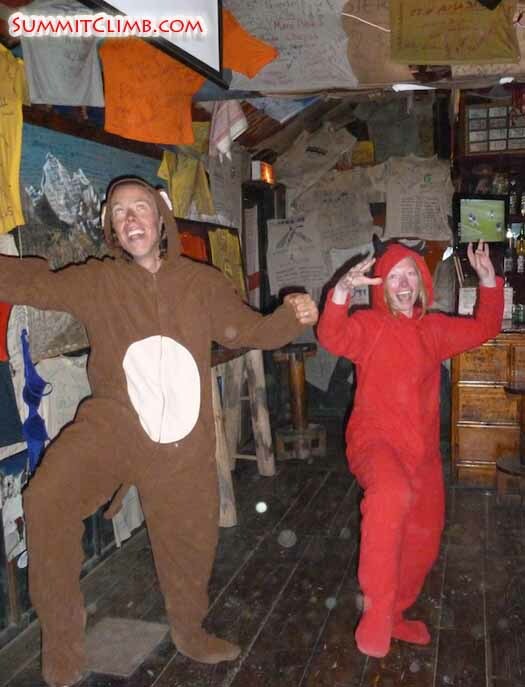 Liam and Richard left 3 days ago to trek and they might show up in Kathmandu in about 1 week from now. We heard that our Baruntse team has finished the climb and is already on the way to Namche Bazar. We really look forward to meeting them tonight. 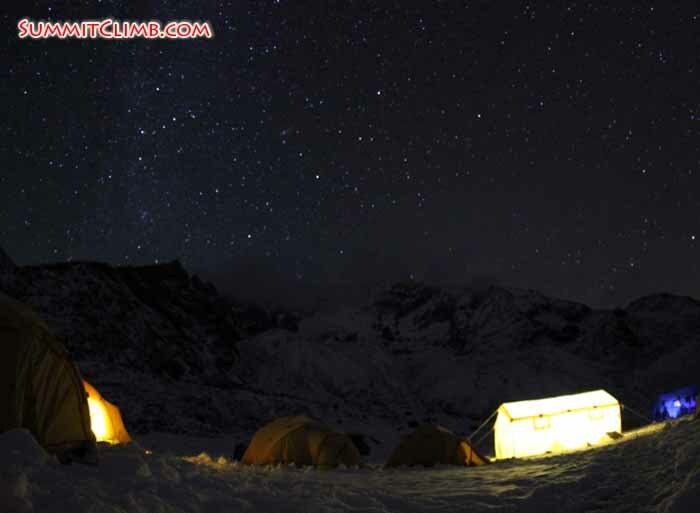 Camp 1 (5800m) at night time - Jean-Michel Meunier. Jean-Michel Meunier enjoying the view from 5800m - Liam Suckling. Camp 2 and our team by the tents at 6000m - Jean-Michel Meunier. Grace McDonald resting during the climb to camp 2 - John Shelton-Smith. 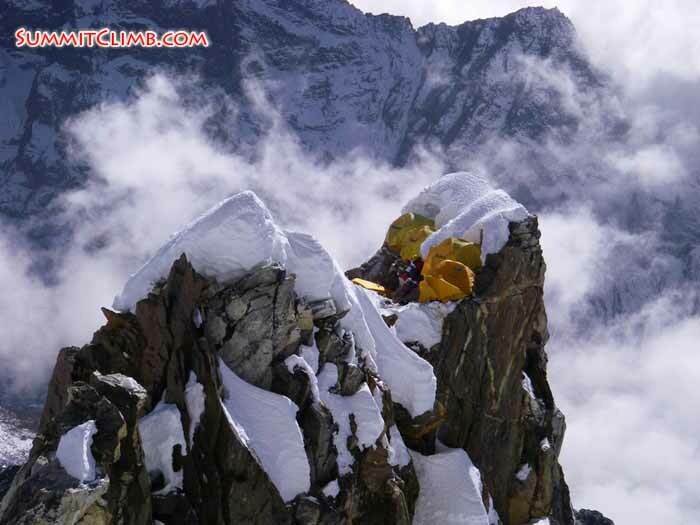 Hi, this is Max Kausch writing a dispatch for the Ama Dablam Autumn Expedition 2011. Today is November 3rd and we are stuck in Namche Bazar. There are no flights leaving from Lukla to Kathmandu and the other way around. The weather seems really bad these days and just like us, there are several hundred trekkers in the same situation. The difference is that we, unlike the trekkers, just climbed a very tough mountain and got used to some very harsh conditions up in the mountains. So don’t worry, Namche Bazar is a luxury for us! The team is thinning up now as Jean-Michel Meunier had to rush home due to work commitments. He cannot afford to wait up here and he’ll have to trek to Jiri for about 3 or 4 days, then finally get a bus to Kathmandu just in time to catch his flight back to France. We’ll miss you Jean-Michel. Have a great journey back home! Richard showed up after summiting Lobuche East alone! After climbing one of the most amazing mountains in the valley Rich simply took his rucksack and almost ran to Lobuche’s High Camp. Next day he summited the mountain (6110m), then ran down back to Pangboche. Then he showed up in Namche this morning. Impressively, Richard said “Sorry” for being half hour late as he agreed to meet us in a bakery here in Namche at 9:30am. Congratulations Richard! Together with Liam, they are getting ready for a long trek through the Rowaling Valley. Good luck boys! Bill had to leave us just as quickly as he arrived. Today he left Namche and hiked straight to Pheriche. 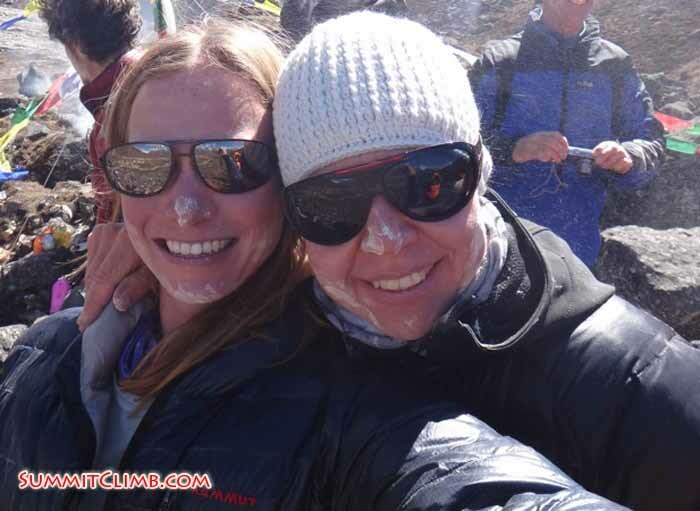 He plans to explore the upper part of the Khumbu Valley a little more, then hike back to Ama Dablam’s Basecamp to make sure that our next female climbers are also having a good time. John is thinking about going home tomorrow, also following the trail to Jiri, 5 days from here (but he is an Ironman, so he might do it in 2 days…). We hope the weather improves tomorrow so John doesn’t have to go. Otherwise, we’ll miss him very much. (Sorry John’s wife, you probably miss him much more!). Violetta, Grace and Frank are still with us. The unexpected rest was very welcome after climbing a mountain like Ama Dablam. 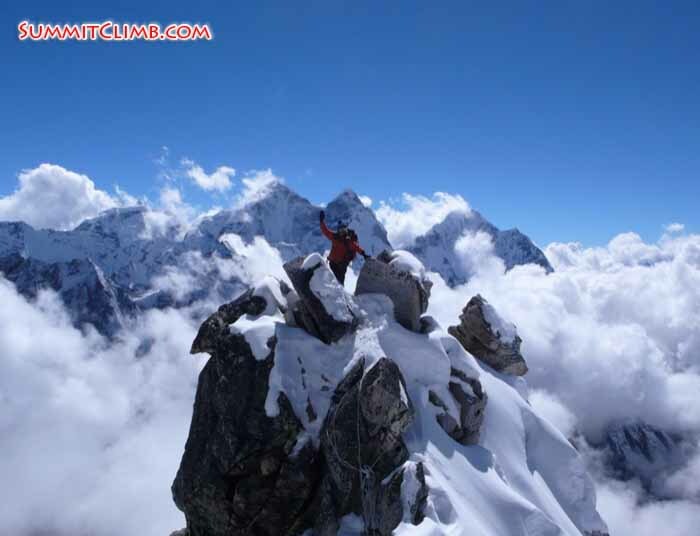 First group at the top of Ama Dablam on October 29th 2011. At top, left to right: Richard Pattison and Jean-Michel Meunier. 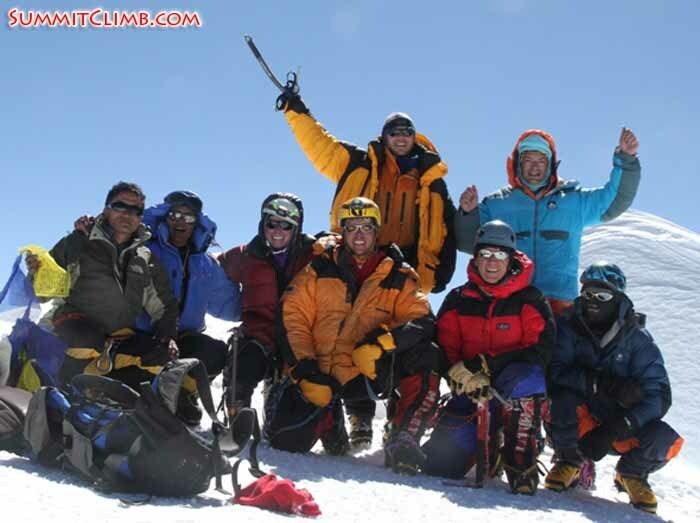 At bottom, from left to right: Pasang Sherpa, Sange Sherpa, Grace McDonald, Max Kausch, John Shelton-Smith and Romain Hoffmann (Jean-Michel Meunier). Jean-Michel Meunier climbing the yellow tower below camp 2 - Liam Suckling. 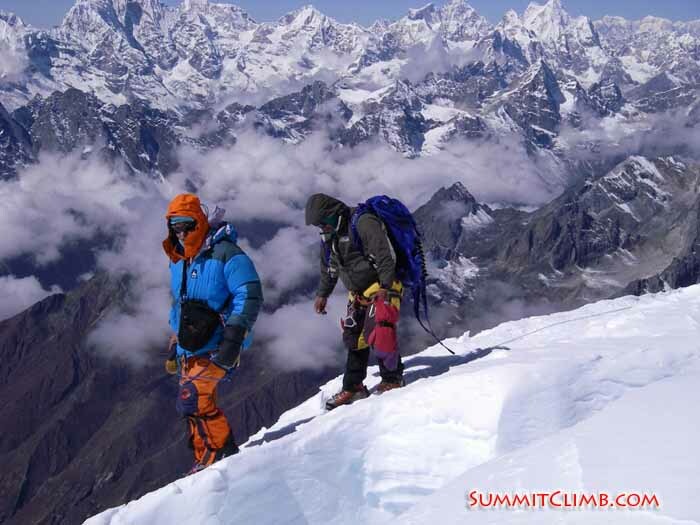 Jean Michel and Sange Sherpa very close to the summit of Ama Dablam - Romain Hoffmann. Grace McDonald training her rock climbing skills - Peter Hamel. It is a great feeling, walking downhill. No longer sucking oxygen. Sometimes climbs are wonderful, sometimes a challenge, but one thing is for sure… when it is done, everything in life seems better. With new friends we walked from Ama Dablam basecamp down the valley towards the Himalayan Paradise of Namche. Lots of laughs were had between the members of the expedition as they bounded down the rocky slopes. Members shared apple pie at the bakery along the way, walked though the Buddhist Monastery, and kicked the changing leaves that have fallen on the cobblestone trail. We wound down through the mountain villages and were greeted with “Namastes” from the locals, and “congratulations” from other trekkers. As lungs fill with oxygen, bellies fill with food, and our brains fill with memories we walk. Smiling all the way. The mist came in the afternoon and covered the views of the valleys. We arrived at a tea house in Namche and settled in for dinner and a celebration. We have all shared an amazing experience together, and now it is time to depart. Ama Dablam is said to be one of the most beautiful mountains in the world, and many of us would agree that it was also a beautiful experience. The mist still clings to the mountains around Namche, the horns and cymbals from the Buddhist ceremonies echo around the stone walls of town. People line the streets with jewelry and yak sweaters to sell. Colored rooftops line the streets, yaks wander amongst the people, and everyone is quick to welcome you in for a warm cup of tea. Namche is truly a magic place. 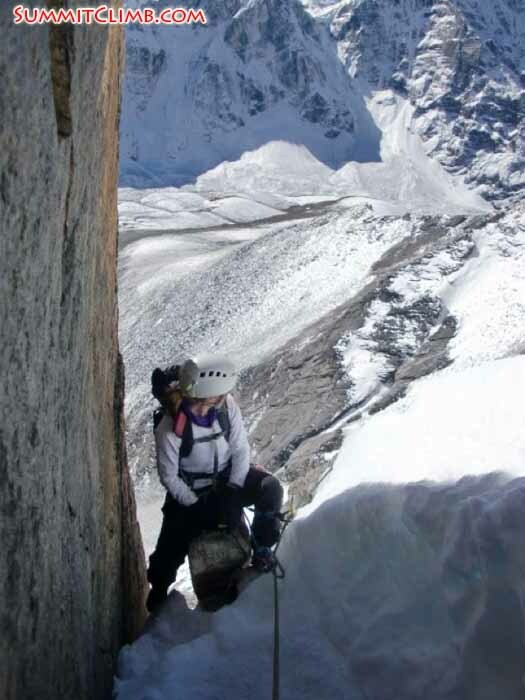 Grace McDonald rock climbing near Ama Dablam - Violetta Pontinen. 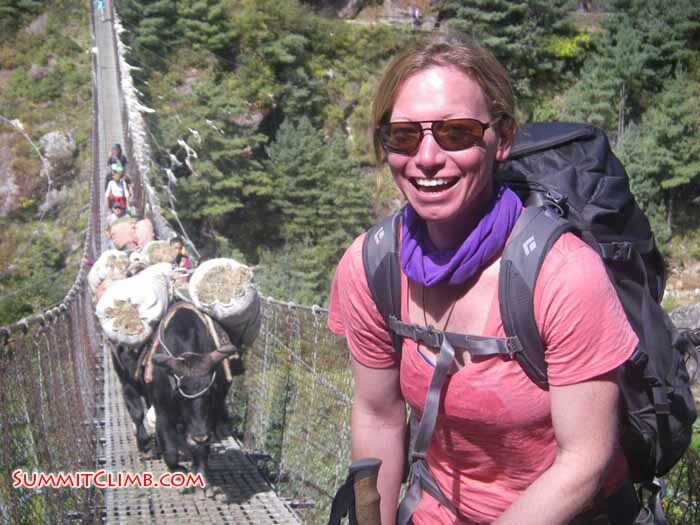 Grace McDonald crossing a bridge on the way to Namche - Romain Hoffmann. Grace McDonald during the climb to camp 2 - John Shelton-Smith. John Shelton-Smith rock climbing at 5900m - Grace McDonald. John Shelton-Smith moving on the yellow tower, one of the most technical parts of the climb at Ama Dablam - Grace McDonald. 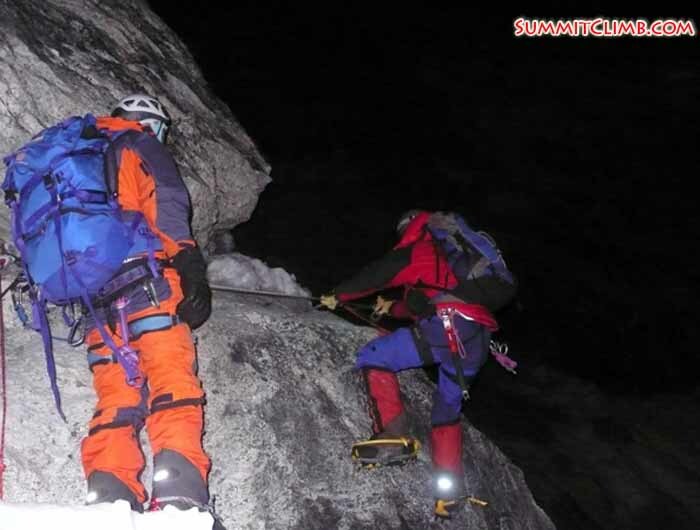 Jean-Michel moving on rocks at 2am during the summit push of Ama Dablam - Max Kausch. 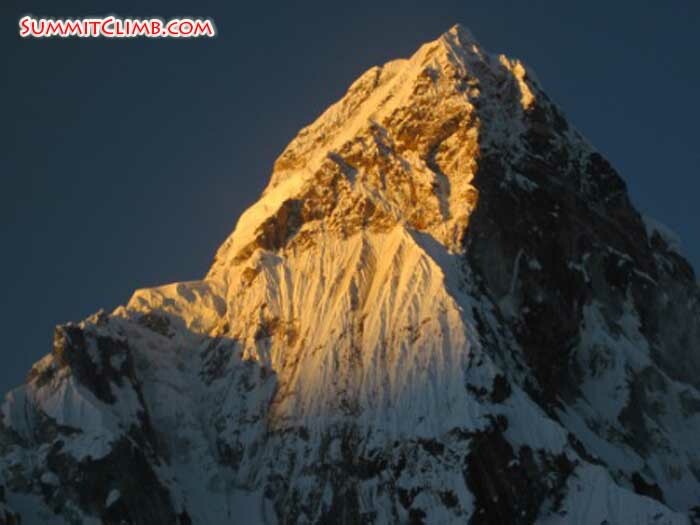 Hello, this is Bill Dwyer with the Ama Dablam dispatch. It’s November 1st. We had a bit of cloud cover this morning, maybe some possibilities of snow this afternoon. Yesterday was a great day, it feels really good walking down hill. Everybody’s in a good mood. The further down we go, the more oxygen we get and everybody’s gulping in the large amounts of O2 and feeling great. We slept at camp 2 last night, which was perched on a ledge all night. Everybody was tired, but felt great. We walked down hill, the mountain was hanging out in the background, giving everybody there a sense of accomplishment. It was pretty good. We got back to the base camp safely and everybody was happy. Today is November 1st and we are in Namche Bazar. Part of our team went trekking around the Khumbu area. 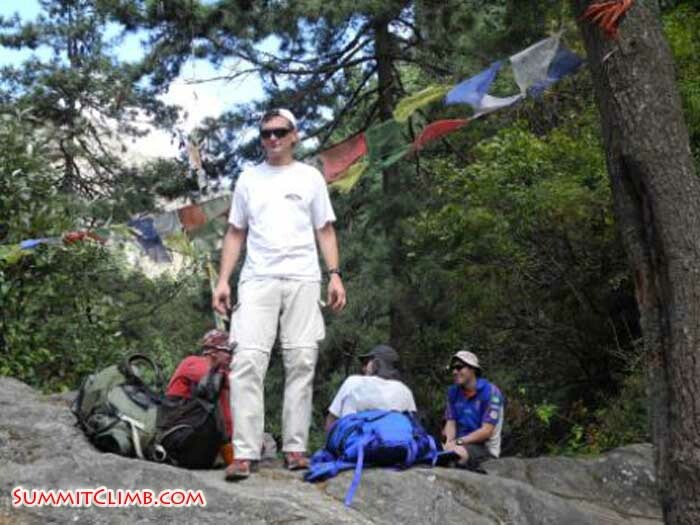 Romain went trekking to Chuckhung, He then plans to cross the Cho La pass back to Namche. Richard and Liam will go trekking to the Rowaling Valley for a couple of weeks. Peter decided to visit Everest Basecamp for the first time. Good Luck guys! The rest of the team (Jean-Michel, Violetta, Grace, John, Bill, Frank and Max) is here in Namche eating good food and sleeping in beds. We heard that no flights left Lukla during the past 3 days due to bad weather. So we might have to stay here for an extra day(s!). Jean-Michel Meunier enjoying the view from 5800m - Liam Suckling. Jean-Michel Meunier climbing the yellow tower below camp 2 - Liam Suckling. 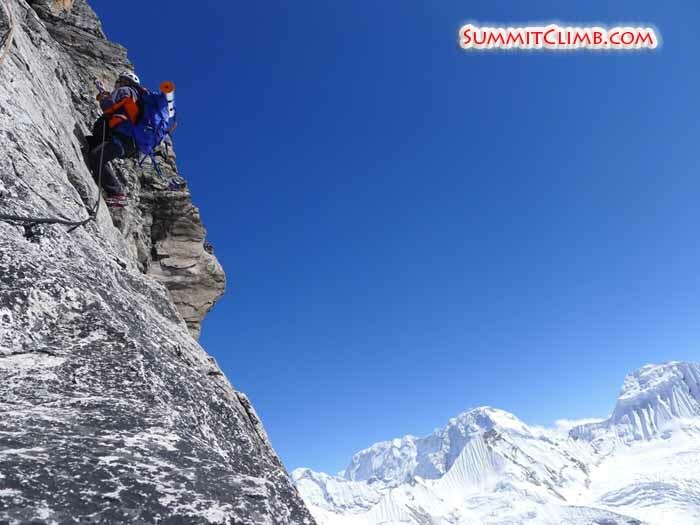 Jean Michel and Sange Sherpa very close to the summit of Ama Dablam - Romain Hoffmann. Lama running a Puja - buddhist ceremony - Liam Suckling. Hey everybody, this is Bill Dwyer calling in, October 31 with the Ama Dablam team 2 expedition dispatch. I just wanted to let you know that we are back at camp 2, everybody’s packing up slowly, nice and quiet. We're all a little tired after the big day yesterday. Everybody who left base camp made it to the top of Ama Dablam, so we’re very happy about that. People pushed really hard. It was a long day, it took about 16 hours going up and down, but the views were incredible, we hardly had any wind. We just had a great time up there. We got awesome views from the summit of all the surrounding peaks and people are feeling pretty good. Today we’re going to be heading down to base camp again, taking it real easy and hopefully getting there this evening and a bit of sleep and celebration. Maybe eat some pancakes. Hope everybody’s well, our team’s going great and we’ll talk to you here again soon. Have a good one. Bye. 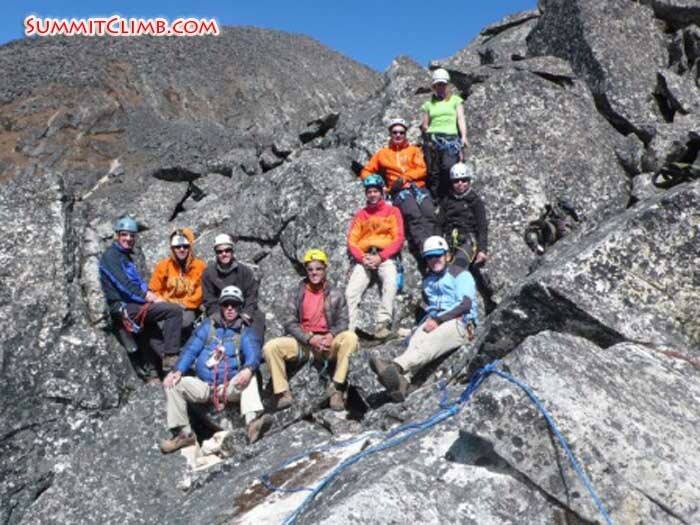 Today is October 31st and I’m very happy to inform that all our members who tried, have summited Ama Dablam. In addition to our 8 summits on the 29th, we had 7 people on the summit yesterday!!! All members and staff are already resting safely here at BC. Looking to Ama Dablam from down here, it is hard to believe that we just climbed this huge and complex peak.Congratulations to our great team!! Both of our groups had amazing views from the top. We were actually able to see 6 of the famous 8000 metre peaks from up there! At the summit we have even established radio communication with the SummitClimb Baruntse team who left Kathmandu on the 14th. It seems that they are getting ready for the summit push and some have already reached camp 2. Good luck Baruntse team!! 6 members are leaving BC tomorrow and will sleep at Namche Bazar. We have already started the preparations for the arrival of Ms Barbara Gorska and Ms Marion Joncheres. They will arrive to BC on November 6th. We really look forward to meet them. Hi this is Max Kausch calling dispatch for the Ama Dablam expedition Autumn 2011. This is for the 30th of October and I’m very pleased to tell you that all of our who tried to summit, reached the summit. The second group reached the summit yesterday. 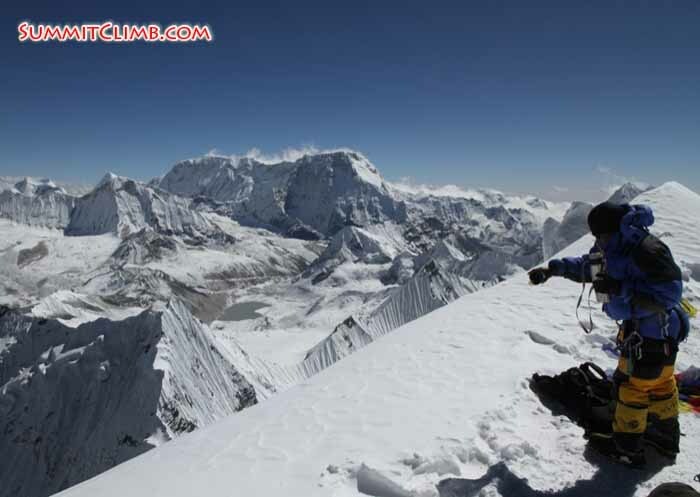 Liam and Tenji Sherpa actually reached the summit at 10:30 in the morning and the weather was very clear and they actually stayed in the summit for more than and hour. 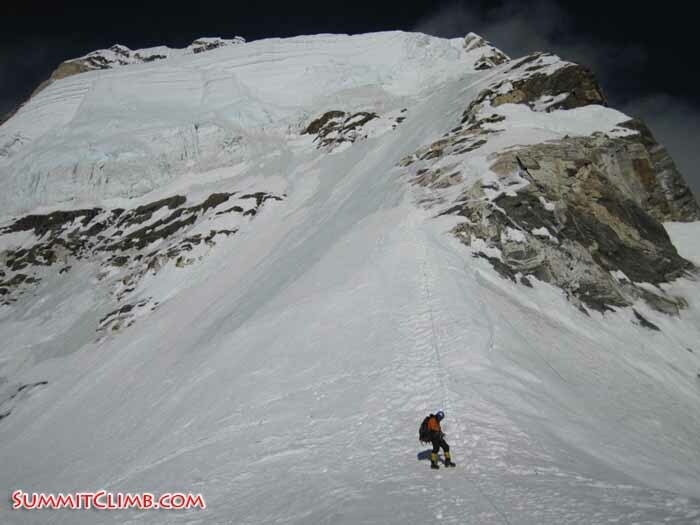 Then Violetta, Peter and Thile Sherpa reached the summit at about 1 pm and they all descended to camp 2. They slept at camp 2 and they’re on their way to camp 1 right now. They’re going to join the rest of the team. 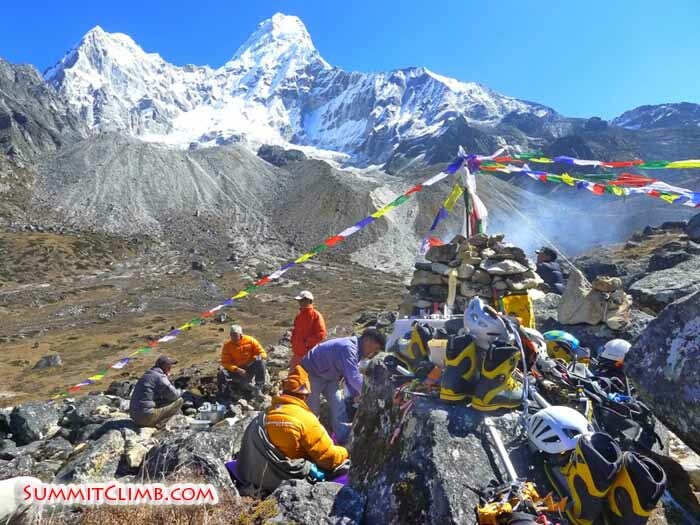 The first group is already at base camp and everyone is resting and fine and the whole group is going to leave base camp together tomorrow morning, which will be the 1st of November. 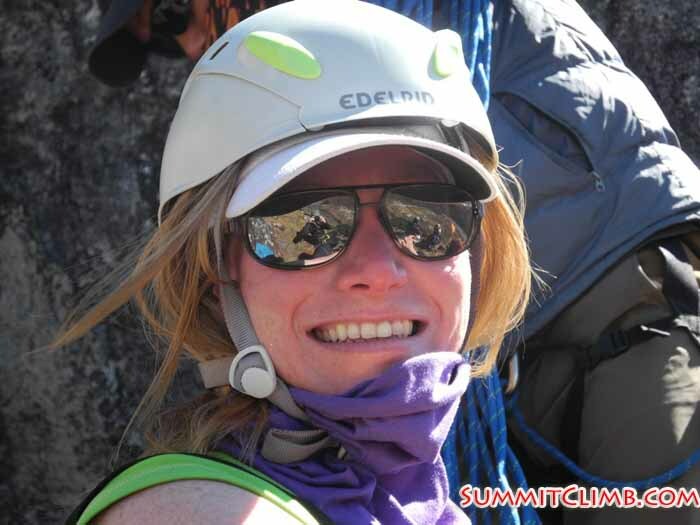 So, thank you very much for following the news of SummitClimb.com. This is Max Kausch writing a dispatch for the Ama Dablam Expedition Autumn 2011. Today is October 29th and we are very happy to inform you that 5 of our members, as well as 2 sherpas and myself summited Ama Dablam today at about 10am. Romain, Jean Michel, Grace, John, Richard, Pasang, Sange and Max shared a few minutes together at the summit of Ama Dablam today. I’ll write another dispatch tomorrow with more summits. Right now Violetta, Liam and Peter are camping at 6000m waiting for their own chance. 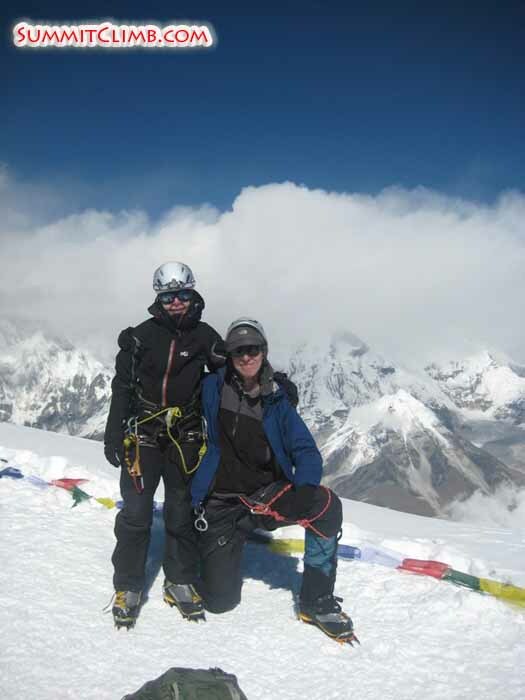 Violetta Pontinen and Peter Hamel at the summit of Ama Dablam - Bill Dwyer. 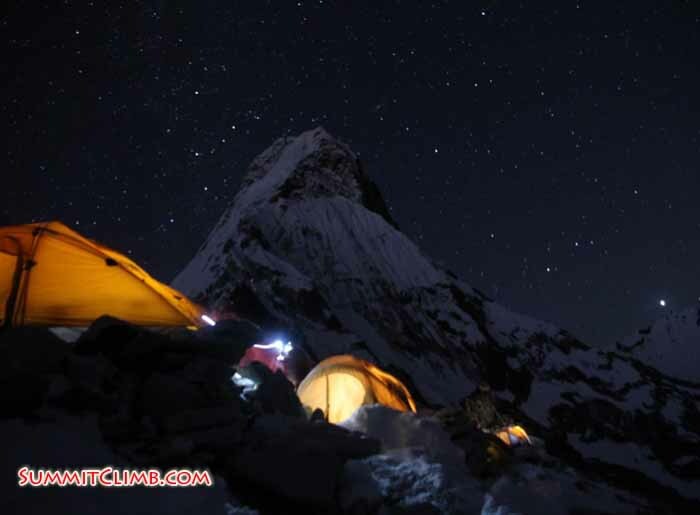 Hey everybody, this is Bill Dwyer calling in with the Ama Dablam expedition dispatch. Today is the 29th of October. Yesterday we walked from base camp all the way up to camp 1. It was a beautiful day, there were some clouds in the sky but wind was down and everybody’s doing ok. We left at about 10am from base camp and got up here around 3pm. People are feeling pretty good, of course winded and tired but really happy about where they are and what they’re doing. Camp 1 is kind of perched on this ridge, it’s a really nice ledge so it’s got amazing views over all the mountains around. We had a great dinner of pasta and mushrooms. So, we had that and that was all great and we had a nice long sleep. Team on the way to Camp 2 6000m - Romain Hoffmann. Hey SummitClimb News, this is Bill Dwyer calling in with the Ama Dablam dispatch, October 27th. I’m calling the day after, sorry about that, I was talking to people until late in the night and didn’t get a chance to call last night, but I’ll tell you what we did yesterday. We said goodbye to group 1 as they headed out to start their trip up Ama Dablam. They all left at different times throughout the morning, for the casual walk up to camp 1. Myself with group 2, bid them farewell and shook hands and wished them luck in the morning. Then, Violetta, Liam, Peter and Frank and myself all kind of sat around and got to know each other a lot more. We spent a lot of hours over tea in tents, talking about things and where we grew up had a lot of fun on that regard. We also had a meeting around lunch time, where we talked about our plan and times and things that we were going to do as we headed out towards mountain. Spent a lot of time with the sherpas, every once in a while shooing the yaks away from the tents and watching the yaks as we drink tea together, it was pretty fun. Another relaxing day, not too much going on. Is very cold today but we are all warm at camp 1 and getting ready to sleep at Camp 1. Team 2 is still at BC and will move to Camp 1 tomorrow. Last night the kitchen staff made us a good luck dinner which included burgers, pasta and a whole cake. 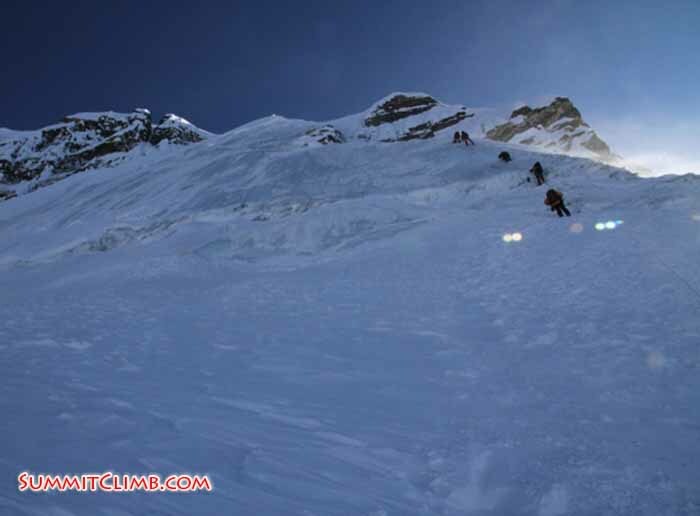 Team 2 is moving to C2 tomorrow and will push for the summit from there. 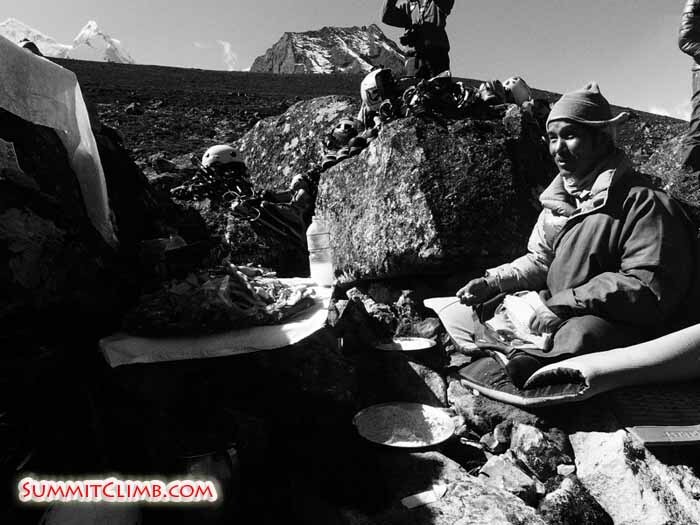 Kitchen staff serving yak burger and pizza at basecamp 4500m - Jean-Michel Meunier. Sange sherpa enjoying the view from the summit - Jean-Michel Meunier. Puja - buddhist ceremony - at Ama Dablam BC - Liam Suckling. Liam Suckling climbing rocks below camp 2 - Peter Hamel. Hanging out in the kitchen tent in the morning is one of the best cultural experiences one can have on a climb like this. The head cook gives orders to the younger boy who is new to the kitchen, as the other experienced men go about their business. The young man adds tea leaves to the milk which boils on the kerosene stove, the smell of steam warms up the group through the frost. An older man uses an older rolling pin to roll out chapattis on a wooden board. When he makes the perfect circle he hands it to the next Sherpa in line who heats it on the large stone over the stove. After the bubbles and fresh bread smell fills the tent he hands it over to the last Sherpa who uses a wire sieve to toast the outside and then wrap it in a blanket to keep it warm for breakfast. The head cook is quick to hand you a warm cup of tea in between maintaining order in the kitchen. It is a morning routine where everyone is able to go about their business in silence, or occasionally joking, but all the while relaxing while breakfast is constructed. This was roughly how the rest of the day went for the group of the Ama Dablam climb. Today we rested as we got ready for the ascent to the summit. Two groups have been split, one will be leaving tomorrow, and the next will follow the day after. The amount of tea that was consumed throughout the day was enough to keep anyone well hydrated and acclimatized. The group got to know each other over the cups of tea and biscuits. People who would not normally be able to talk to each other in everyday world are thrust together in the mess tent. Lawyers from Canada talk with backpackers from Australia, retired doctors from California share biscuits with French fathers. One of the highlights of a trip like this is meeting adventurous people from around the world. On a rest day like today, we are able to really get to know each other as people. Max led a meeting with the group over lunch about the next summit bid, and after questions the anticipation and excitement was embedded in everyone. 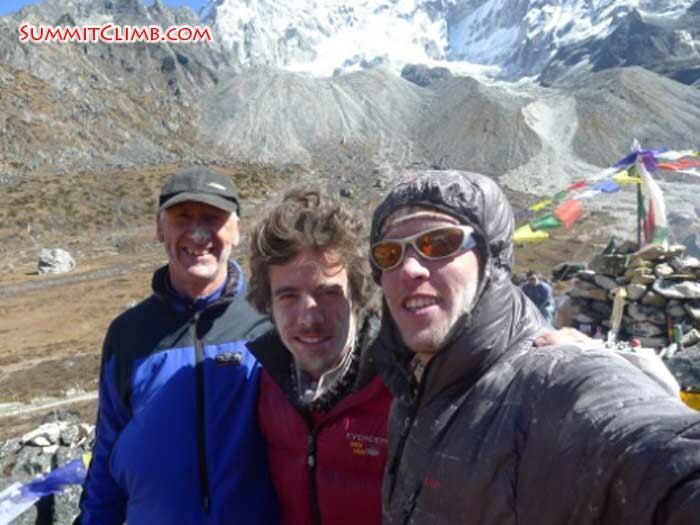 The whole autumn 2011 Ama Dablam team (Max Kausch). Hi, this is Max Kausch writing a dispatch for the Ama Dablam Autumn 2011 Expedition. Today is October 24th and we are back to basecamp at 4500m. We had a very exciting day today! We all woke up at about 7am at camp 1, 5700m, just after sunrise. For breakfast our cooks made us pancakes, fried pepperoni and porridge. Believe or not, all this was made in our kitchen-almost-hanging-tent at 5700m! The weather was really helpful and we had a perfectly clear day with no wind at all. Everyone geared-up and we started the most enjoyable and technical part of the whole climb: the section between camps 1 and 2. Most of our members carried a small load to drop at camp 2 while some of our sherpas worked hard to build tent platforms over there. 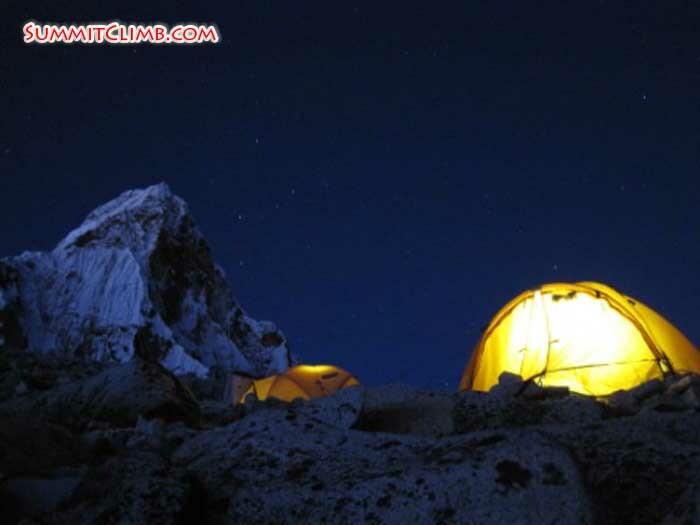 Camp 2 is located at the top of an amazing rock tower called “yellow tower”, at 6000m. 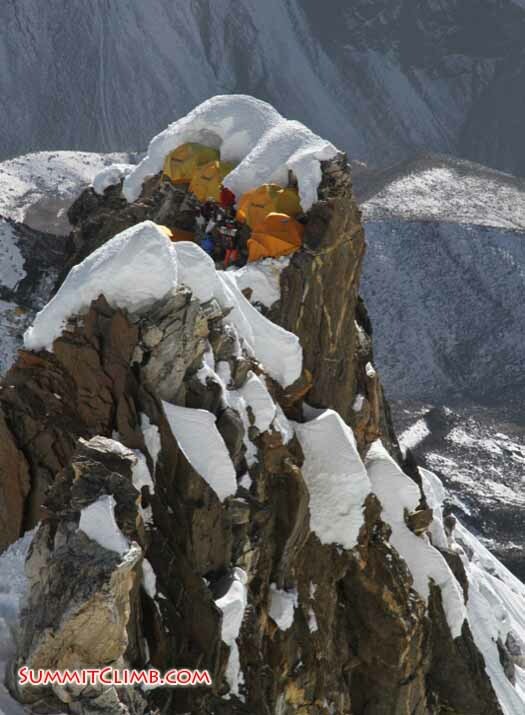 This is literally the only place between 5700m and 6300m where one can place a tent. No need to say that the views from there are amazing. The yellow tower is the most technical part of the climb. But above all, is one of the most fun parts of the whole mountain. The rock there is very solid and dry. Also, there are very good hand and foot holds. 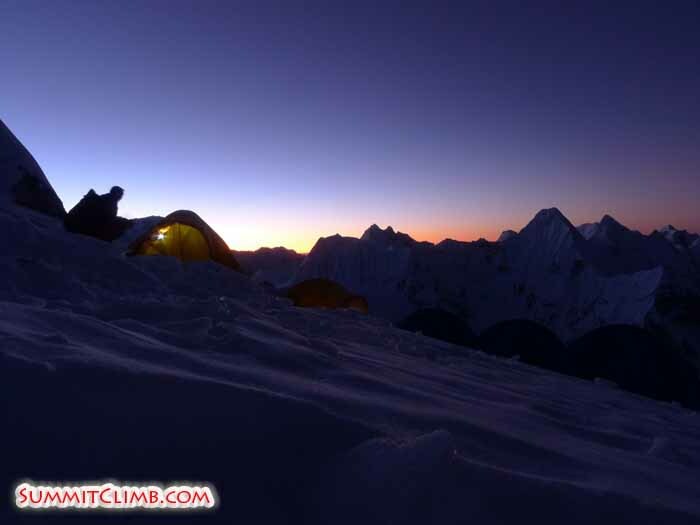 All our members and sherpas reached camp 2 today and all got back to basecamp late afternoon. 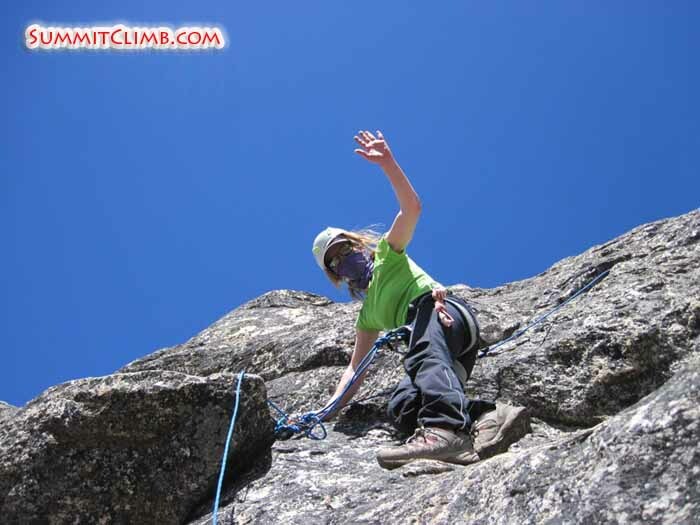 On October 20th Violetta fell while coming down from camp 1 to ABC and twisted her ankle. We were all very worried about her especially when we saw her coming down to basecamp in great pain. Violetta however is a very tough climber and recovered in only 2 days. She not only started walking with a little difficulty, but she went all the way to Camp 1, then climbed to camp 2 today and came down all the way to basecamp. Very impressive! Congratulations Violetta! Our plan now is to rest at least 2 days here at basecamp and push for the summit with our team split in 2 smaller teams. Most of our team left ABC this morning and headed here to Camp 1 at 5700m to sleep for the first time. There are a lot people here right now and is very snowy. Camp is actually covered with snow. We have 8 tents up here and also a kitchen tent. 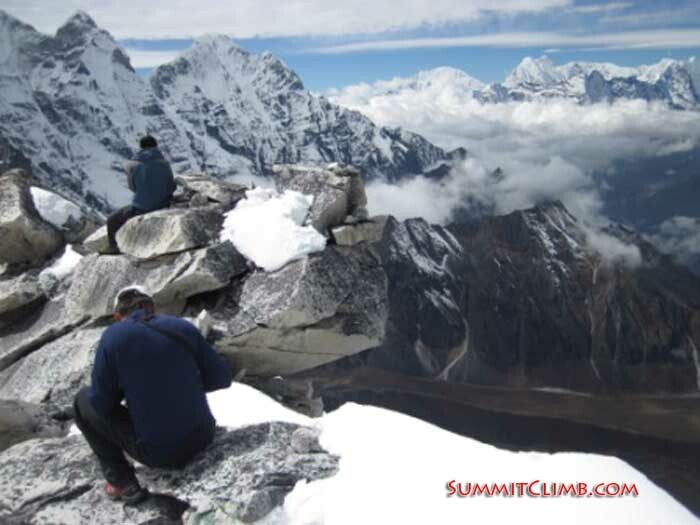 We have amazing views over the ridge and can see Pangboche, Tengboche and Basecamp. Everyone is doing very well without any problems. Ama Dablam seen from ABC (Peter Hamel). We had a good rest day at basecamp yesterday with some fairly bad weather. It snowed on the whole mountain yesterday and even our basecamp was covered with snow. The snow stopped in the afternoon, but we still had cloud cover. At least the storm hit while we were resting and not when we were at high camps. 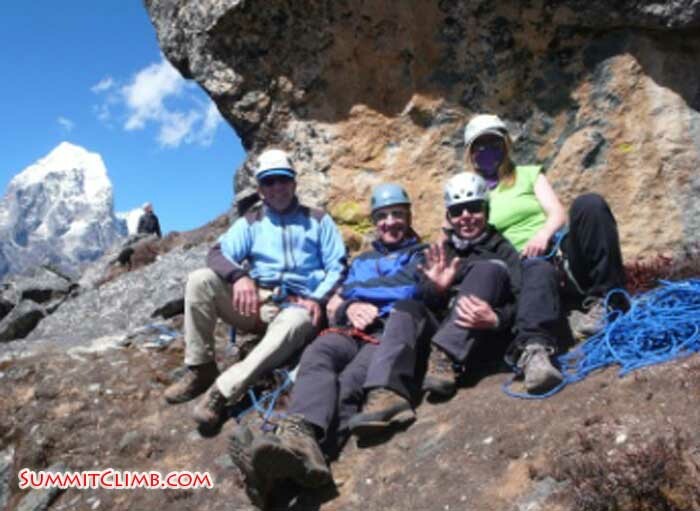 After a good rest day we left basecamp today and reached ABC, at 5250m. It was a very light walk Again, the sunset was amazing from here. Everyone is very well and hydrating right now. We hope we’ll reach camp 1 tomorrow before noon. Amazing night shot of our tents in ABC (Peter Hamel). Hi, this is Max Kausch writing a dispatch for the Ama Dablam Autumn 2011 Expedition. Today is October 20th and we’re back to BC. We had a very productive day today. The whole team woke up with a “tent tea” served by our kitchen staff at 5250m. The views were amazing and sky was very clear. Everyone felt very well with no altitude problems so we carried a load to Camp 1 at 5700m. Our staff set a kitchen tent at Camp 1 and also 5 tents for our members. Having a kitchen tent on such a high camp might sound extravagant but this really helps everyone to acclimatize and increases the chances of summiting. It means a lot having a cook at camp 1 when you come down tired or you wake up feeling dizzy because of the altitude. So far we’re the only team around here with a high kitchen. All our member dropped equipment loads at camp 1 then started the descent back to BC at 4500m. Everyone was down here by 3pm. We’ll take a rest day tomorrow, then we’ll sleep at 5700m for the first time. 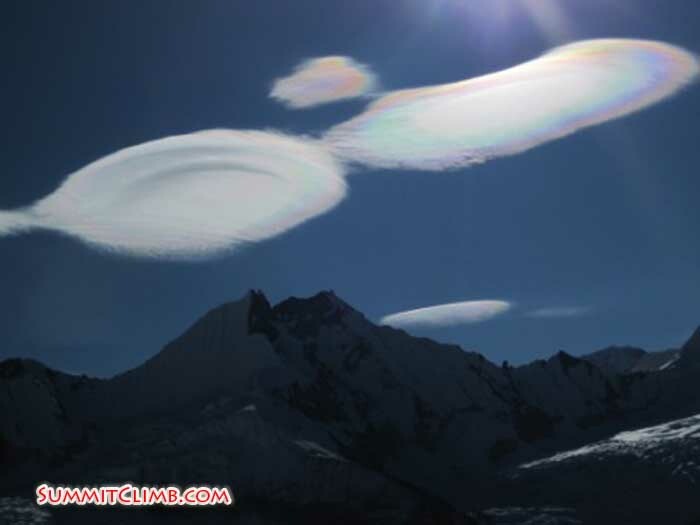 Amazing lenticular clouds seen from 5500 metres (Peter Hamel). We’re currently at ABC, 5250m. Now its about 9pm and everyone is sleeping. ABC is on a 25 degree slope with a few tent platforms dug on a few steps. There are many rocks and boulders here. Believe or not, we have a kitchen tent here with a cook. He just served us with delicious pasta and white sauce and there seems to be unlimited supplies of tea and juice in the kitchen. Right now there are millions of stars in the sky and the sunset was just perfect. All members left BC this morning and trekked here for about 2 or 3 hours. Everyone is very disciplined and is acclimatizing very well. We have a very experienced team and everyone knows very well what they are doing. 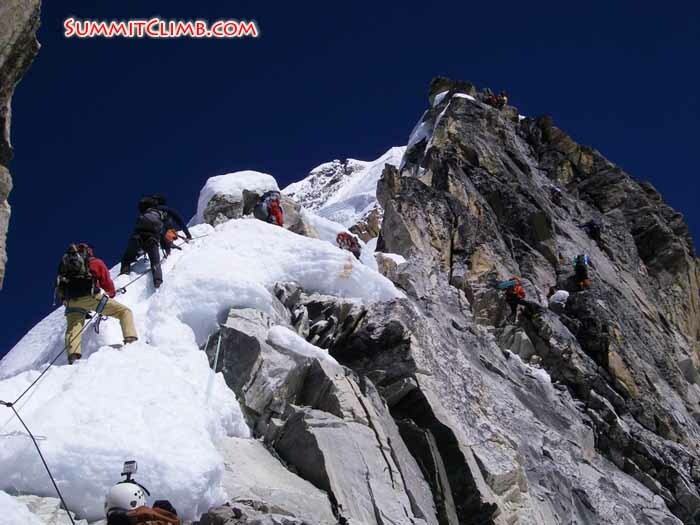 We are planning to reach camp 1 tomorrow and take a load with climbing equipment there. Our staff will also set a kitchen tent there. Jean-Michel and Romain calling home next to a 600 metre cliff in camp 1 (Peter Hamel). Today we had a puja (Buddhist ceremony) just above our base camp. We called a Lama from Pangboche to run the puja. The sherpa are very superstitious about this and they even bless their climbing equipment or anything that touches rock or ice. 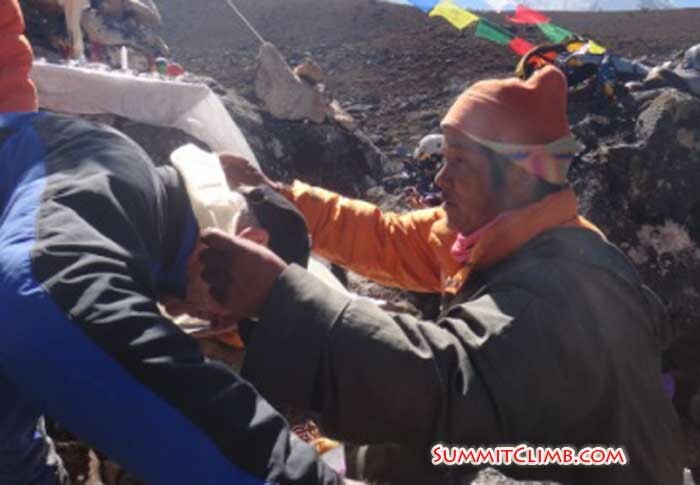 Although many of our members don’t really believe in such Buddhist ceremonies, they really respected it and also brought their climbing equipment to be blessed as well. The sherpa were very happy as our stupa (rock pillar where puja is executed and religious flags are hang from) was higher than any other at basecamp. After our puja most of our members went trekking to acclimatize. Most of us passed the 5000m line and felt very well. At the same time our members went trekking, a few yaks took all the high altitude equipment to Advanced Base Camp (ABC) at 5250m. We are planning to sleep there tomorrow together with all our sherpas. John getting blessed by the lama during our puja (Grace McDonald). From left to right: John, Liam and Max covered with flour at our puja ceremony). Our puja, Tenji holding a cup of Rakshi (Liam Suckling). Frank, John, Violetta and Grace resting during our training day (Max Kausch). 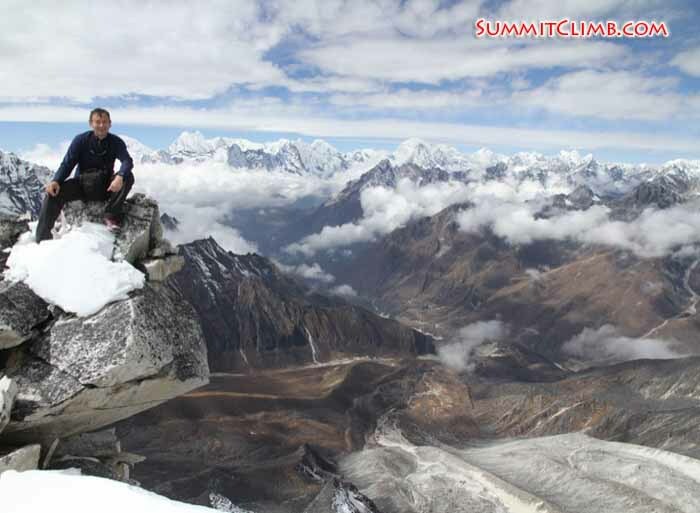 Hi, this is Max Kausch writing a dispatch for the Ama Dablam Autumn Expedition 2011. This is for October 17th. Today we had a rope fixing training in a nearby hill. Our sherpas and I fixed some ropes on rocky terrain so our members could practice fix rope climbing and review their rock climbing and vertical techniques. We all had a lot of fun and learned a lot with the training. We also had great views from up there and could see the whole basecamp. 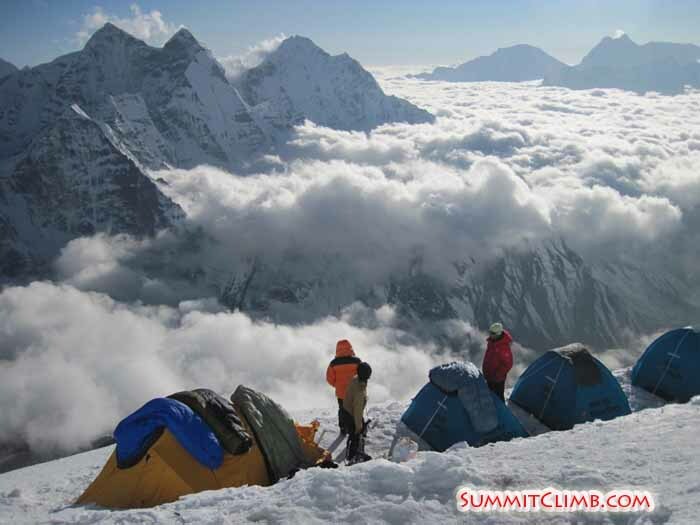 Even from up there we could see SummitClimb basecamp which is actually huge! 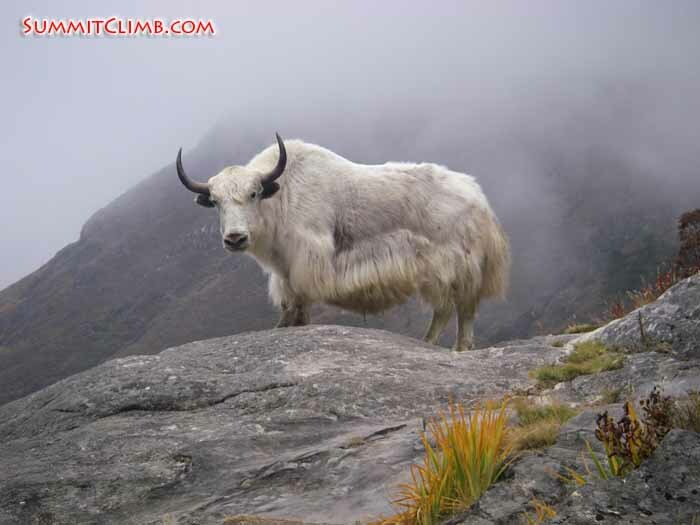 Tomorrow is our puja day, then some yaks are carrying equipment to ABC at 5100m. Our members will go for an acclimatization walk towards ABC but everyone will sleep right here at BC. Richard and John hanging from the ropes during training (Max Kausch). Liam looking up the rock face where weconducted our fixed line training (Max Kausch). The whole team after our training (Tenji Sherpa). 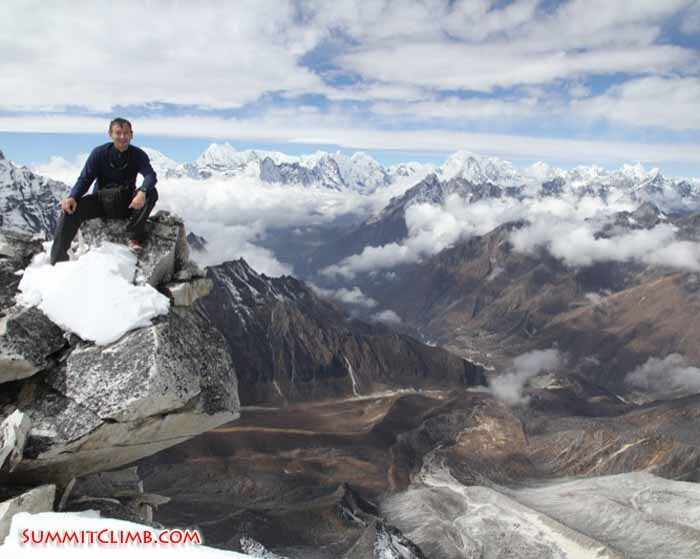 Hi, this is Max Kausch writing a dispatch for the Ama Dablam Autumn 2011 Expedition. This is for October 16th. All our member arrived to BC today. It's beautiful here! Camp is actually a massive grassy field with 2 water streams cutting it. 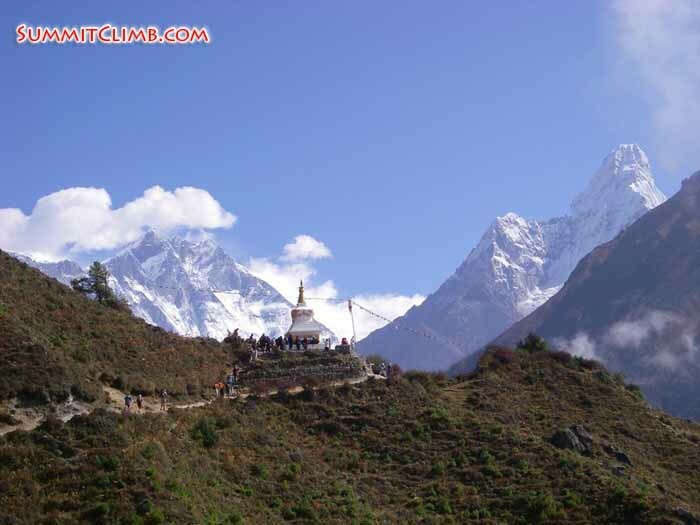 We can see 8 or 9 impressive mountains from here and of course, Ama Dablam. Our camp is well organized and each member has a tent. We also have a toilet, shower, dinning tent, storage tent and kitchen tent. The trail to ABC starts 20m away from camp. There are also 5 other teams here and some of our members went there today to meet them. The weather is great in the mornings and early afternoons but might be a little cloudy late afternoons. Everyone is feeling great and no one had any symptoms of high altitude diseases at all, not even headaches! We are very proud of our members and staff for arriving here safely and with no problems. All the cargo arrived carried by 31 yaks and 8 porters. We all get the feeling that our expedition started really well. Tomorrow we’ll climb some hills nearby and revise the rock climbing techniques of our members. Although our team is very experienced, we all need to revise some skills so we all can be very sharp by the time we touch rock at camp 1. Amazing photo of Ama Dablam taken outside of Namche (Liam Suckling). 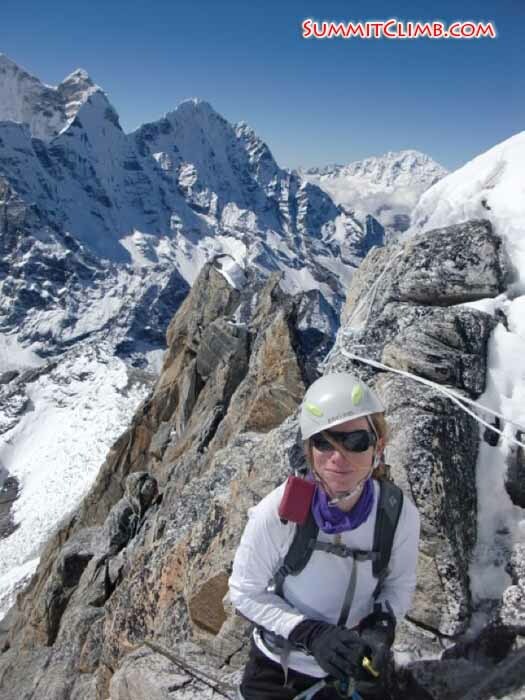 Hi, this is Grace McDonald writing a dispatch to the Ama Dablam Expedition Autumn 2011. The team spent the last couple of days in Namche, relaxing and enjoying the scenery. Some splurged on lodge rooms (with shower!) 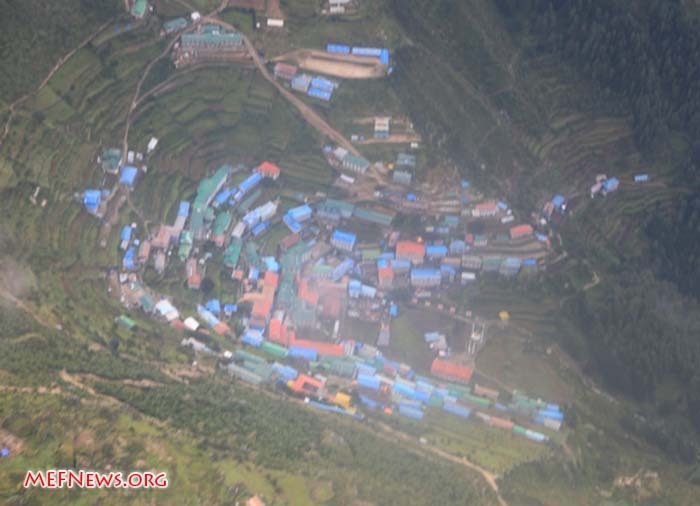 closer to town centre while most slept up top overlooking Namche in tents. Great view but it was a nice punishment for the lodge takers to have to hike up to the top of town for meals. Left us breathless every time! Most of the group took acclimatization hikes on our rest day up to Kumjung and the Everest View Hotel while others who were already acclimatized hung around town. We found a new restaurant in town (8848) and discovered it had the perfect balcony for sunning yourself, eating and people watching virtually everyone who arrived in Namche. It also provided a nice perch from which to aim projectiles at other team members. Various team members came and went over the course of about 4 hours and we tried close to half the menu - great food!! By the time we left we were stuffed and knew everyone in Namche at least by face. Some of us figured it would be our last chance for the pub before the mountain and it was nice to socialize with the local trekkers. We were joined by a cool group of Norwegians who we had of course spotted earlier in town. They had a 16 and 17 year old with them who were on their way back down from a big trek and got up to just over 6,000 m - very cool. We eventually called it a night after lots of laughs and good conversation and everyone headed off to bed. Today we all enjoyed breakfast and headed out at our own pace towards Pangboche with a plan - lunch by the river, apple pie in Tengboche. 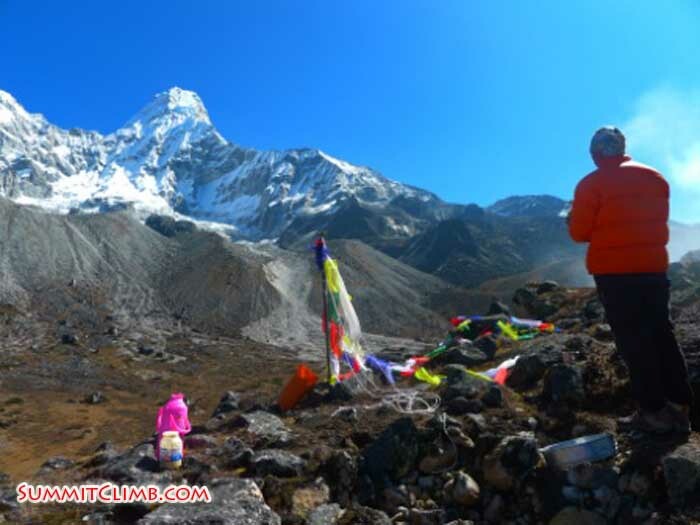 The weather was fantastic until about Tengboche, with great views and Ama Dablam and we all moved quick. Right now I'm sitting on a rock in the mist in Pangboche. The sun is gone and it's a bit chilly. Everyone is safely in the dining room resting from the long walk. I think we'll sleep well tonight. Most of us splurged for rooms tonight but a few are staying in tents. We'll rest up and head to base camp tomorrow. Everyone is doing really well. We've actually got a really experienced team and we're looking forward to getting settled into basecamp. Thanks for following our posts. We'll try to get others to take a stab at writing and hopefully have more fun to share with you in the coming days. We are in Namche Bazar, the sherpa capital at 3450m. 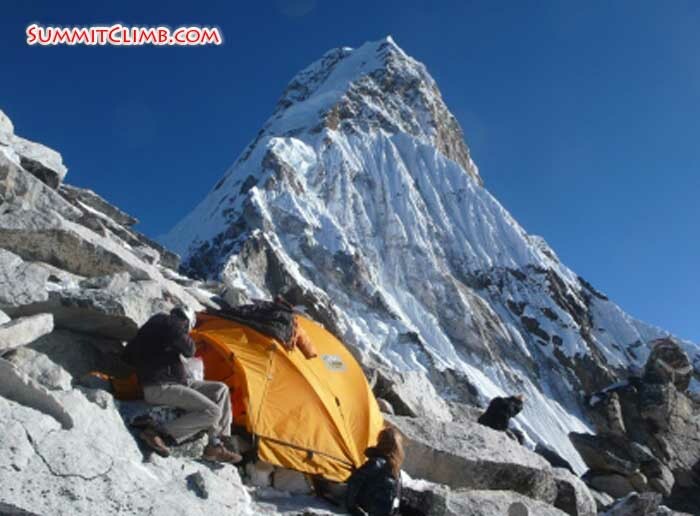 Everyone is doing very well and we all look forward to see Ama Dablam for the first time tomorrow. We arrived here after a 5 hour trek, followed by 25 sturdy and friendly yaks with our equipment. Today we met the Everest View Glacier School team and the Everest Basecamp team. They will leave Namche tomorrow morning and we'll stay another night to acclimatize. The weather is great and skies are blue pretty much the whole day. We had no problems with flights, porters or yaks. Tonight at dinner our members started a oxygen saturation competition using a small device called pulse-oxymeter. And guess who won the competition? Mr Frank Sarnquist who is 69 years old! 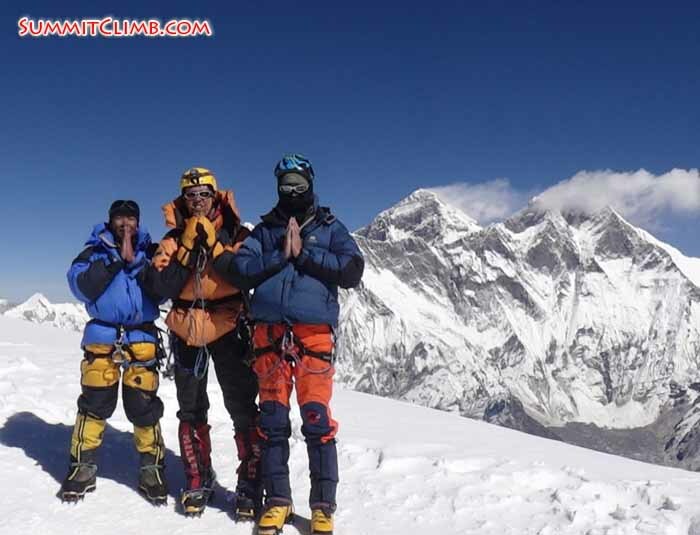 Detail, in our team we have members who just climbed an 8000m peak and 2 sherpas who just climbed a 8200m peak! Congrats Frank! We'll enjoy our rest/acclimatization day here in Namche. We have restaurant, bakeries, pubs and equipment shops so don't worry about us! 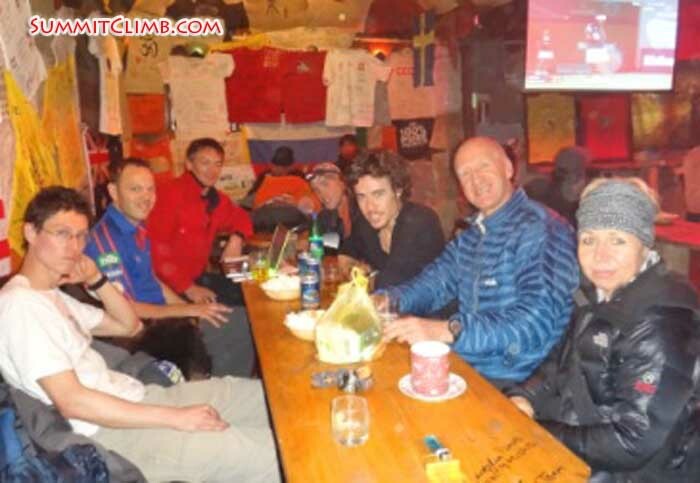 Team at a local pub in Namche (Grace McDonald). Jean-Michel, Violetta, and Grace on the trek to Namche (Max Kausch). Hi, this is Max Kausch writing the first dispatch for the Ama Dablam Expedition Autumn 2011. We left Kathmandu today and made it to Phakding, at 2300m. All members finally arrived in Kathmandu on October 10th and we had a briefing meeting on the 11th. Everyone is feeling well and healthy and we look forward to seeing Ama Dablam for the first time tomorrow. 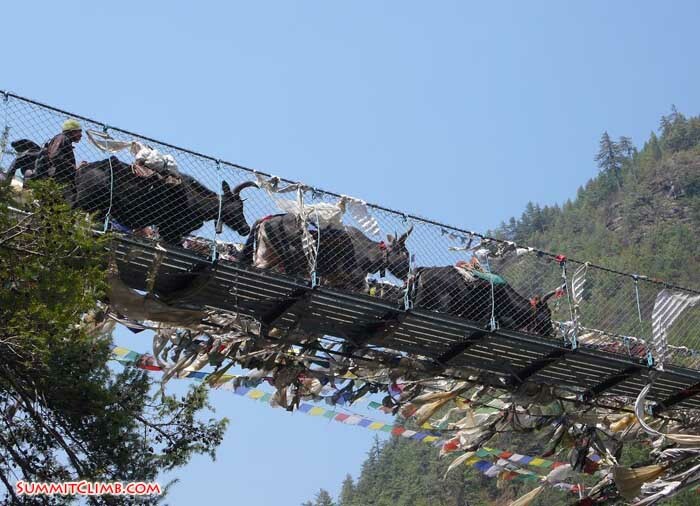 Yaks crossing the last bridge on the way to Namche (Max Kausch).